The relief of Kimberley was a cavalry operation. After the success of Paardeberg, Lord Roberts unleashed his cavalry commanded by General JDP French on a dash to relieve Kimberley. French took nine regiments and a squadron of the 6th Dragoons - over 3,000 men. A further 17 cavalry regiments were represented by 22 officers and 51 men. Three members of the Imperial Yeomanry were also present, one officer and two men who were servants to General French. 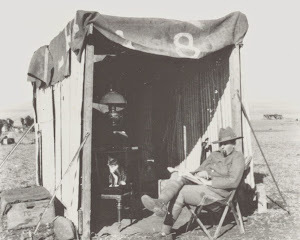 No British cavalry regiments were present for the relief of Mafeking - it was a "colonial" affair - Rhodesians, Canadians and south Africans. The formal British mainland representation was just a company of infantry drawn from Barton's Fusilier Brigade - Royal Fusiliers, Royal Welsh Fusiliers, Scots Fusiliers and Royal Irish Fusiliers. Nonetheless 19 British cavalry regiments were represented at the relief of Mafeking, 11 officers and 48 men. Out of the 18-20,000 men under General Sir Redvers Buller's command in the campaign to relieve Ladysmith there were only two and a half regiments of regular British cavalry; 13th Hussars, 14th Hussars and the 1st Dragoons. Additionally there were very small drafts (less than 30 men each) from the cavalry regiments trapped in Ladysmith; 5th Lancers, 5th Dragoon Guards, 18th Hussars and 19th Hussars. Yet a total of 16 other regular cavalry regiments were represented in the campaign, all very small detachments numbering from 1 up to 8. Their participation was rewarded with two possible clasps; Relief of Ladysmith and Tugela Heights. The Tugela Heights clasp is less common, men could have been sick or found other duties as the campaign wore on. Most of the officers would have been on Buller's Staff, the other ranks would have been signallers, servants or attached to colonial units. See this blog for a detailed analysis of the 1st Life Guards detachment. Additionally two volunteer cavalry units were represented. Colonel Baron Gerard along with two privates from the Lancashire Hussars served on Buller's Staff and Lt FW Jarvis of the Loyal Suffolk Hussars was attached to the 13th Hussars.